ADRIFT - The pioneer of white water rafting in Uganda and one of the most popular and respected adventure operators in the country has partnered with KAYAK THE NILE - also a pioneer and highly reputable company to provide some spectacular combos of activities that combine the best water experienes that the River Nile has to offer. 3 and 5 grade rafting combined with white water kayaking, stand up Paddle Boats finishing off with Sundowner Nile cuirses with drinks on sit on top Kayaks. 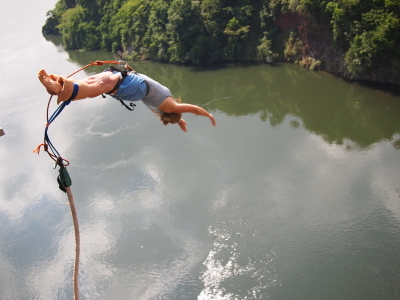 Throw in a bungy jump and we have you covered for the discerning adventurous traveller or the adrenalin junkie. Its a one stop booking proceedure. Whilst most activities either include transfers from WWL to the put in points or are conducted directly at WWL - there are some where if returning to WWL an additional per car vehicle transfer cost may be applicable. Please note this when inquiring for the combos although we have highlighted it below. Widely regarded as the best white water combo on the River Nile. A full day rafting where the rapids are challenging and legendary in the hands of those who know the river best. Enjoy a great lunch on Malubisi island mid-stream in the Nile (this option is unique to Adrift). Relax beneath the spacious thatched roof. Late afternoon drop off at WWL. Following day enjoy an introduction to white water kayaking around Wildwaters Lodge. 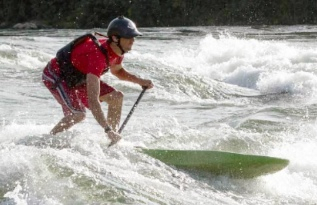 Warm water, sunshine, tropical islands, and the perfect introductory rapids. Our introduction day is sure to give you a memorable experience, off the tourist trail. 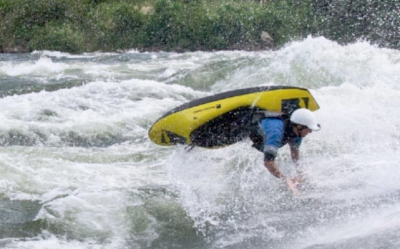 The day is designed to teach you the skills that you need, even if you have never been in a kayak before, to go with one of our guides to the whitewater – a secluded part of Uganda unseen by most tourists. This is our most popular option – another tick on the worldwide bucket list. For the adrenaline junkies we highly recommend this excellent combination offer of Rafting, White water kayaking and Bungy jumping. 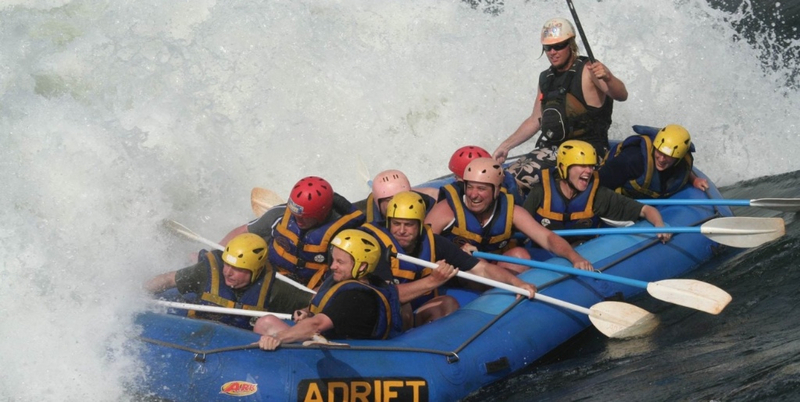 Enjoy a full day of rafting on the greatest rapids The River Nile has to offer. Follow this with an introduction to white water kayaking around Wildwaters finishing off with a Bungy jump over the River Nile. Pure adrenaline every day, every moment. The first day will be your rafting day. The 2nd day you will enjoy the introduction to white water kayaking before being transferred to the Bungee Tower in the late afternoon for your jump. If you wish to return afterwards to Wildwaters Lodge we can arrange this for you at an additional charge. Truly memorable experience. Departure from Wildwaters Lodge, kayak amidst the breathtaking scenery of Wildwaters Reserve on the world’s most famous river. Marvel at the birdlife and raft through the breaking waves. The more adventurous family members can river board down some rapids and surf the legendary waves of ‘Nile Special’. Afternoon transfer to the Bungy Tower for your Jump into the River Nile. If you wish to return afterwards to Wildwaters Lodge we can arrange this for you at an additional charge. For those that dont have a lot of time and are not restricted to returning to WWL after the trip but want to fit in as much as possible this is the best there is. Pick up from WWL and enjoy a half day rafting. 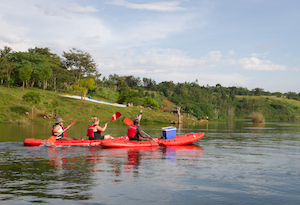 This is followed by either an afternoon Source of the Nile tour on a Stand up paddle board or Sit on top Kayaks or you might wish to just relax and do a sundowner cruise instead and overnight in Jinja. For those that wish to return to WWL on the same day would not be able to fit this in. 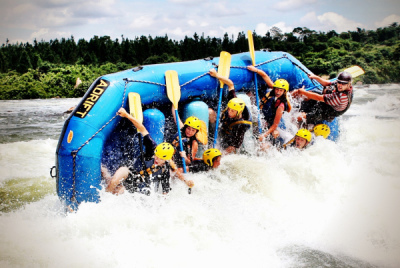 What is also a great option to consider here is inbetween rafting and kayaking is an optional Bungy jump in the Nile and this can be added as a supplement making this a triple affair. Morning pick up to the rafting put in point and enjoy a day of rafting on this great river. Enjoy rapids under the experienced guidance of our team before enjoying lunch. Afternoon some more rapids before returning to WWL. Following morning directly from WWL take a relaxing Kayak Cruise amongst the jungle and tropical islands on a flat water section of the famous White Nile. This slow paced activity is suitable for a variety of ages and no prior paddling experience is needed. Our guide will entertain you with local stories and share his knowledge of the wildlife found in this paradise. A scenic and peaceful experience and this experience can either be a morning or a sundowner experience. For those that dont have a lot of time but want to fit in as much as possible , this is a great adrenaline hit. Pick up from WWL and enjoy a half day rafting. This is followed by a bungy jump and for those that want to return to Wildwaters Lodge a transfer can be arranged with a supplement.